Barbara Lum poses with a photo of herself from 1973 showcasing what was then a state-of-the-art incubator. NorthBay Healthcare lost its “Mother of Maternity Services” with the death of Barbara Lum on May 8, 2015, at David Grant Medical Center where she was being treated for severe congestive heart failure. She was 87. Her mission was providing compassionate care and advanced medicine for the tiniest, most vulnerable members of our community and their parents. Mrs. Lum retired from NorthBay Healthcare in 2006 after 40 years of service. She was a registered nurse, longtime manager of maternity services and is credited with laying the groundwork for the creation of NorthBay’s Neonatal Intensive Care Unit 30 years ago. Even before her retirement, she was an active member of the NorthBay Guild. 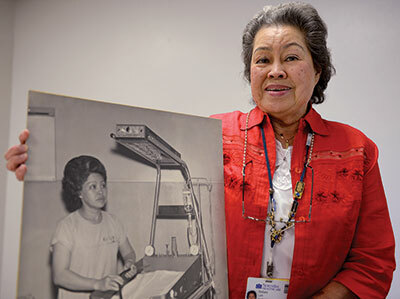 Mrs. Lum joined Intercommunity Memorial Hospital in 1966, and became director of maternity services in 1973. After her retirement, she continued to serve NorthBay as an instructor for NorthBay’s Human Resources Department and a NorthBay Guild volunteer. In this capacity, she was able to combine her love of nursing with her love for tennis, by serving as chair of the Golf & Tennis Classic’s tennis tournament for many years. Just a few days before her death, Mrs. Lum joined a team of NorthBay colleagues in a roundtable discussion with local press to celebrate the NICU’s upcoming 30th anniversary. She shared with the group her early memories and observations regarding the many changes seen in the last three decades. She was passionate about her mission of providing compassionate care and advanced medicine for the tiniest, most vulnerable members of our community and their parents.”Babies are my business,” she said plainly. A memorial service was held in her honor May 30 at NorthBay Healthcare’s Green Valley Administration Center. She is survived by her daughter, Cindy Lederer (Mark); sons Bruce Lum (Grace) and Tony Lum (Dede); four grandchildren and three great-grandchildren. She was preceded in death by her husband Bob and sons Michael and Russell. Mrs. Lum was so passionate about maternal care at NorthBay that she endorsed the creation of a special endowment fund to benefit families of NICU babies. The Robert and Barbara Lum Endowment fund was established when her husband, Robert, passed away in December 2014. Contributions came from friends, employees and physicians throughout the organization, as well as through a successful March of Dimes’ “March for Babies” walk at Lagoon Valley Park. The fund reached its minimum investment threshold of $10,000 in the days just before Barbara’s death, and will continue to serve NICU families through perpetuity. Anyone wishing to contribute to the fund in her memory can do so by sending a check to NorthBay Healthcare Foundation, and putting “Lum Endowment Fund” on the memo line, or making an online donation at NorthBay.org, selecting the “Support NorthBay” tab, then the “Donate Online” buttons. Choose the Lum Endowment Fund from the designations menu.